Siena Palio – 2nd July and 16 August each year. Our guests and neighbours say this is a difficult Palio to go and see, apparently you have to wait for hours in the baking sun in the central piazza of Siena if you want standing tickets, or the seated tickets reportedly cost a lot of money. The race itself is 90 seconds. We haven’t been so we can’t confirm that but we have been the day after the race and there was a parade in full medieval costume with drums and flags, with the winning horse, its hooves painted golden, taken through the streets of central Sienna to show to everyone then led into the packed and very silent church of the winning contrada to be blessed. A great ocasion in itself, and Colin Firth was spotted in the crowds watching this, so join the celebrities and go along for the spectacle. Palio delle Barche, Passignano – held on the last Sunday of July, in 2012 on Sunday 29th July at 18.30. The citizens of Passignano on Lake Trasimeno line the streets to watch their champions compete in a medieval boat race with a difference, the first part is on land. It involves teams of strong men carrying the boats on their shoulders in a fast and hair raising running race through the streets, then launching their boats into the water and rowing around to the beach, with loud cheering from the crowd. Afterwards there is a meal in the square on trestle tables with live music. There are processions in medieval costume and ceremonies before the race too. The evening is finished off with fireworks at midnight over the lake. Festival of Folklore – Ronzano (the next village towards Fratta). In 2012 this is 27, 28 and 29 July – check posters on the walls in Camucia for the exact details.The main event is a dinner at one of the local farms on trestle tables, with duck and fried rabbit as their speciality, and dancing under the stars afterwards. We turned up on the night to join in but it was absolutely sold out, not a seat to spare and no cancellations. Booking ahead is a must, look out for the posters around Camucia with the booking phone number on it. Sagra dei Cinghiale – Pergo (a little village below Cortona, it is signposted from the windy road on the way up to Cortona). For the last 30 years Pergo has held a wild boar sagra on their soccer field in this quiet little borgo on the last weekend in July or first weekend in August. In 2012 it is being held on 4th and 5th August. Wild boar is widespread in the wooded hills around Arezzo and Cortona. At the sagra you can sample usually a wild boar stew (the boar is marinated beforehand according to the age of the animal, between 6-18 hours in wine, vinegar, garlic, herbs), and wild boar pasta with wine followed by dancing. Check the Cortona tourist office or look out for the wall and street posters around Camucia for exact dates and times. Sagra dei Piccione – Montecchio, a village between Il Pino and Cortona, (one of Pagus’s first developments in this area is located there). Every year they have a pigeon sagra which is reported to be very good. Held on the last weekend in July or the first weekend in August. In 2012 it is their 39th sagra and is held on 1-5th August, and there will be an orchestra to play while you dance under the cupola of the stars. 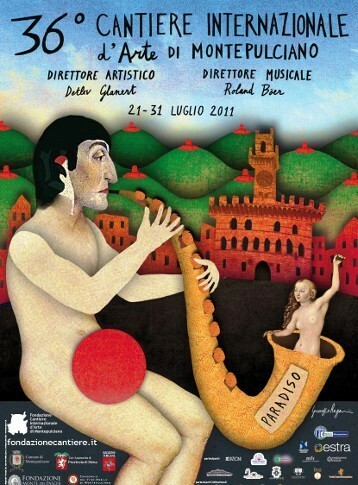 Tuscan Sun Festival – This has moved to Florence in 2012 and is now held in June. Sagra della Bistecca – Cortona. This excellent beef steak festival is held on the Ferro Agosto weekend. 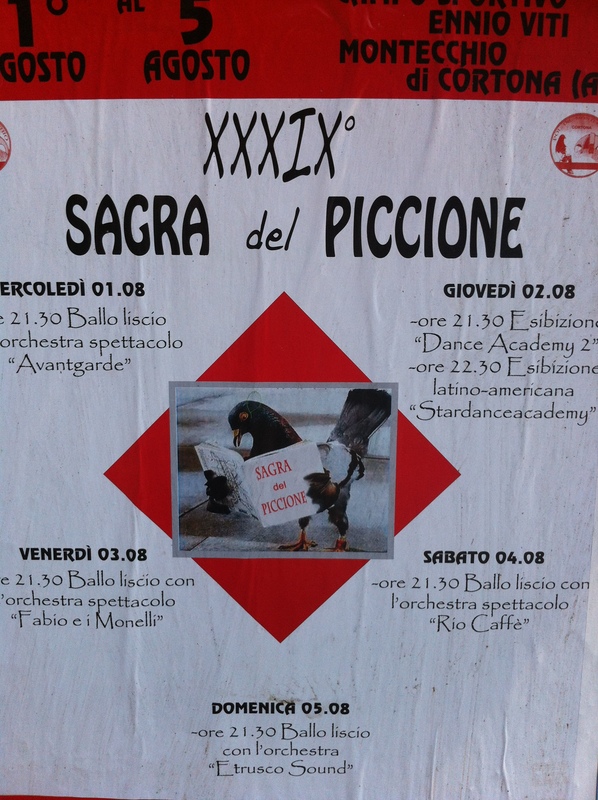 In 2012 the sagra will be 14th – 15th August. It is held in the lovely public gardens overlooking Lake Trasimeno. You buy a ticket at the gate, which gives you a bottle of robust red local wine, an almightily huge Chianina beefsteak done al sangue (pink in the middle – and no, they don’t do well done), local bread and a little dish of beans and a ripe juicy peach for desert which you eat on the trestle tables with local families in the cool of the evening under strings of lights on the trees in the gardens. The barbeque where all the steaks are cooked is enormous – 14 metres square, and they cook several thousand steaks during the sagra, worth seeing just for that. It is getting popular so go and eat english time around 7 or risk standing in the queue for a later supper. Sagra del pesce (fish festival) – Passignano. We haven’t been but its on every year, this year 2012 it is 23-26 August, local fish are cooked on a giant frying pan which is 4.30 diameter, check with the tourist office for exact dates. Bravio delle Botti – Montepulciano. The Bravio is a race to push massive 80kg wine barrels up the steep hills of Montepulciano’s streets. 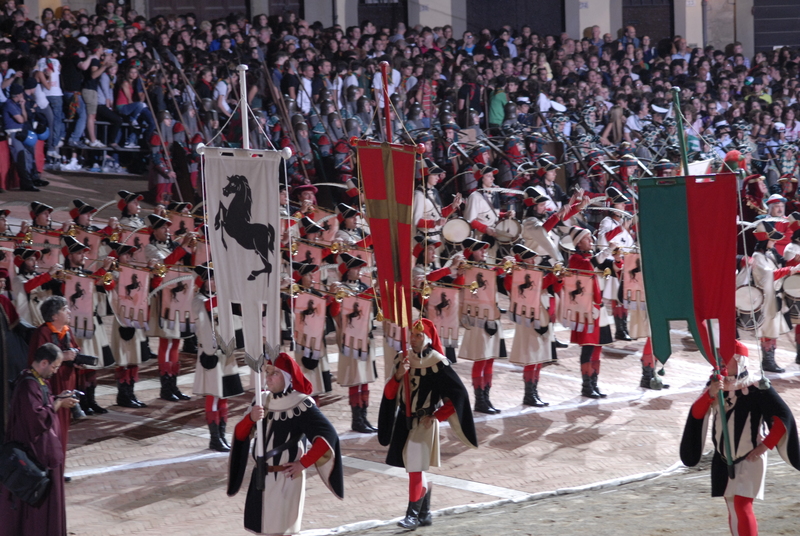 Each contrada competes for the honour of their quarter of the city. Specialist athletes “spingitori” are brought in to do the race, as it is extremely difficult and large sums of money are paid for the best. The race is held every year on the last sunday of August, starting at the Lion Column but there are processions and other celebrations beforehand as well. If you can’t make the race, it is still worth going during the week for the other events. On the last Thursday in August there is a procession starting at 9.15pm (ish this is Italy afterall) for which all the electric lights, street lights, restaurant lights and signs – everything are extinguished leaving the city in medieval darkness lit only by candles and flaming torches lining the path of the procession. It is a spectacular sight with renaissance princes and princesses and loads of men in tights with drums finishing with a show in the main piazza of music, traditional flag throwing and fireworks, starting at 10pm. The procession starts at the lowest point of the town and works its way up to the main piazza, a good place to watch is on the flight of steps of the church halfway up the hill, where locals pass around glasses of wine to whoever is sitting next to them. Every evening from that date onwards the contradas, or city quarters, hold outdoor”pop-up” restaurants which spring up in various locations, under the stars in courtyards or on the terrace of an ancient palazzo, where you can eat their speciality dishes handmade by the nonnas and mammas of the contrada, at trestle tables with a bottle of Vino Nobile alongside crowds of locals, before the evenings celebrations begin. We went to this last year and had a great evening. The menus for this year are postively gastronomic and include pasta with chick peas and saltcod, roast pork, steak Fiorentina style. Sagra del fungo porcino – mushroom festival held in Cortona. It is held around 22nd and 23rd August but its best to check the dates with the tourist office before you go. The mushrooms are imported for this sagra, as its not mushroom season. Pecorino fair, Pienza – first Sunday in September, we’ve not visited this yet. Festa della Zucca – pumpkin festival in Foiano, the world champion pumpkin race was held here in 2009, including members of the Pumpkin Club of Foiano. There is a contest for the biggest pumpkin, which are enormous, and free tastings of pumpkin bread, pumpkin ravioli, and pumpkin fritters. Giostra del Saraceno, Arezzo – 5th September 2010, similar to the June event but held during the daytime. Sagra del Uva e Castagna, Pergo (at the foot of Cortona) – we’ve not visited this but it was advertised in 2009 for 20th October. Cortona Antiquaria – Antique fair in Cortona with exhibitors from all over Italy, 27th August to 11th September. Sagra del Tordo (festival of the thrush) Montalcino – last weekend in October, archery tournaments, historical processions and local cuisine. In late May/early June Cortona hosts their annual Giostra dell’Archidado (Joust of the Archers).It’s held on the Sunday of Pentecost (Whitsunday) which in 2011 is Sunday 5th June. There are colourful parades in medieval costume, flag waving and other events on each night for the week before culminating in a crossbow shooting competition on the sunday for the honour of the golden arrow in Piazza Signorelli. Check with the Cortona APT (tourist office) for more info or go to http://www.cortonaweb.net/it/eventi/32-xxvi-giostra-dellarchidado (translate the page with Google translate if you don’t read italian). Calendimaggio – Asissi. We haven’t been but its highly recommended by the Festivals of Tuscany website (which we’ve shown a link for in the Festivals, Sagre and Palios category of this blog). First Thursday, Friday, and Saturday after the first of May. Sagra del Pastasciutta, Fratta San Caterina – The pasta feast of St. Catherine at the local village of Fratta San Caterina (where the hospital is). In 2012 the dates are 8,9 and 10 June and 15,16, and 17 June. In 2010 this Sagra had 6,000 admissions. It is a pasta festival and this year the menu looks great. They will have rabbit stew pasta for those loyal to timeless traditions, or if you are feeling a little braver, try the past amatriciana (spicy tomato pasta), there will be a vegetarian pasta (perfume of the forest or a fresh tomato pasta) and for those who love strong flavours there will be a hare and wild boar pappardelle pasta and a seafood risotto. It is all for a good cause, run by the local Sport Association for the last 16 years. We are going with guests on Friday, we’ll let you know how it went. Giostra del Saracino – the Jousting of the Saracen takes place in Arezzo in June at night (23 June 2012) and again in September (Sunday 2nd September 20) during the day. What you see, after months of preparation, are parades through the town in full medieval costume (even the ambulance service wear monks attire) followed by drummers, flag throwing, and then horseback jousting at a huge dummy of the Saracen in competition for the golden lance. It is fiercely contested and well supported by a big crowd. The night time Giostra is magnificent. For the full experience, go for the best seats in the house in Tribuna A, which in 2012 are €50 each for the best seats right by the Saracen with a fantastic view of the whole square. Tickets for foreigners are on sale early, from 19th March but are limited in numbers so get in early (ie. months before if you can). They can be bought at the official website http://www.giostradelsaracino.arezzo.it, or email the nice people at giostradelsaracino@comune.arezzo.it and ask for their help to reserve your tickets (in english is fine). You can do it cheaper, by taking seats in Tribuna B at €35, or Tribuna C at €25, or by going the rehearsals which take place earlier in the week (16th to 20th June in 2012 from 8.15pm with the experienced guys practising from 9.30pm onwards), or by standing on foot with the crowds on the night, but the latter option is very voluble and somewhat excitable, not for the elderly or very young. The night Giostra takes place about 9pm but on the day of that Giostra, when we went in 2009, there were not even standing tickets available by 1pm. 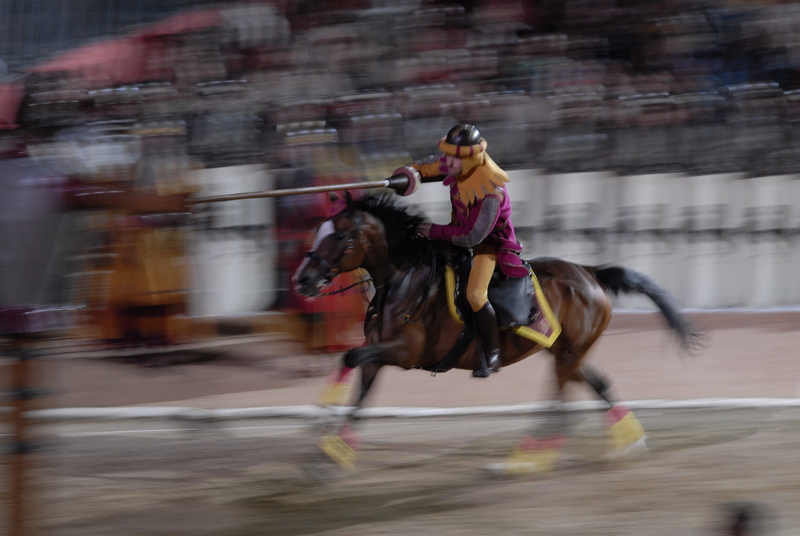 We highly recommend it, as good the Siena Palio. Watch the witch La Befana arrive to give sweets to good children or coal to bad children, she arrives by boat at Passignano with entertainment, jugglers and theatre for children on 6th January. Each year hundreds of villages and towns in Italy have their own sagra, a food festival that celebrates their own local speciality. Many of the bigger towns have a palio, or race, which is the culmination of a year of preparation and hotly contested by the quarters of the city, in medieval dress, with drummers and flag throwing and a great show for locals and visitors alike. We’ve done an extensive internet trawl to try and find what festivals like these are on near Il Pino each year and when. It wasn’t easy, there is no one definitive site, there’s not one list that covers all the nearby provincie and commune (Arezzo, Siena, Cortona, Foiano, Trasimeno etc etc ), and not all the festivals are “official” and the dates for each of the festivals can vary from year to year. So its a good idea to check on the web or with the tourist office before you go to any of them or just look at the posters which are stuck up all over the place on town walls just before the event. For events on Lake Trasimeno try : http://www.passignanosultrasimeno.org. This website also has a good up to date list of Tuscany wide festivals: http://www.festivals-of-tuscany.com. On the following pages of this category there is a month by month list of the more local ones we’ve been to and heard of so far. Please do check the dates, especially for the sagre, as they change slightly sometimes each year, and we are not always able to confirm the exact dates. It is certainly not a full list, so please tell us of any events you think are worth going to.